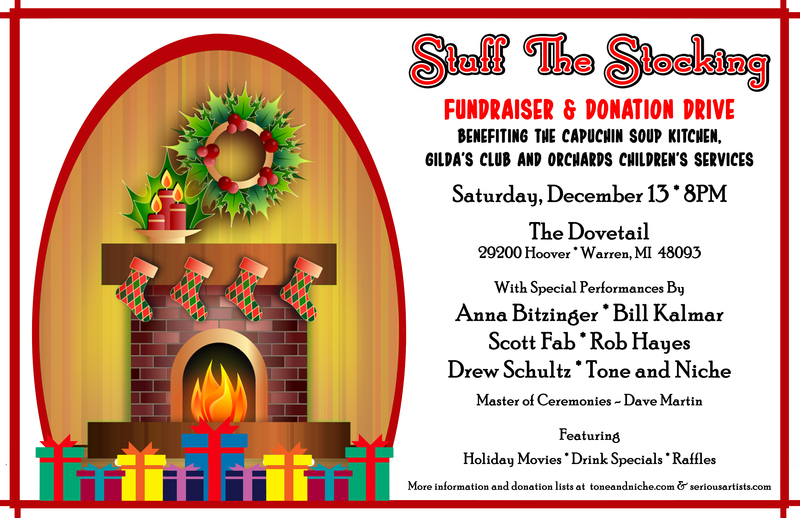 Stuff the Stocking returns for its tenth edition this December to help collect donations for those in need. This year’s event will support the Capuchin Soup Kitchen, Gilda’s Club and Orchards Children’s Services. This year’s event will be hosted at the Dovetail. The event will feature some of the Detroit areas finest performers, some new to the event and some veterans from the past Stuff the Stockings. Music Performances from Anna Bitzinger, Bill Kalmar, Scott Fab, Rob Hayes, Drew Schultz, and Tone & Niche. Aside from excellent live performances from some of the areas finest musicians, the event will also feature music and cafe’ raffles, drinks specials and more! So come out and be a part a night of music, art and giving. The event is a great way to help those in need as we enter the 2014 Holiday Season! ← Anthony Retka’s Big Parade Officially Released!